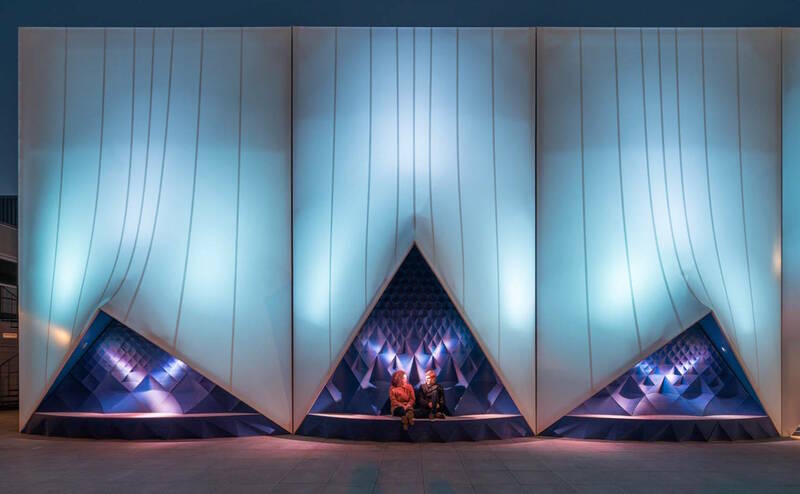 Heijmans and DUS Architects teamed up to design and build a stunning 3D-printed facade for the entrance of the modular Europe Building in Amsterdam. Created to celebrate the start of the Netherland’s six-month Presidency of the European Union, the white facade was 3D-printed with playful curves inspired by the yachts previously built at the marina site. 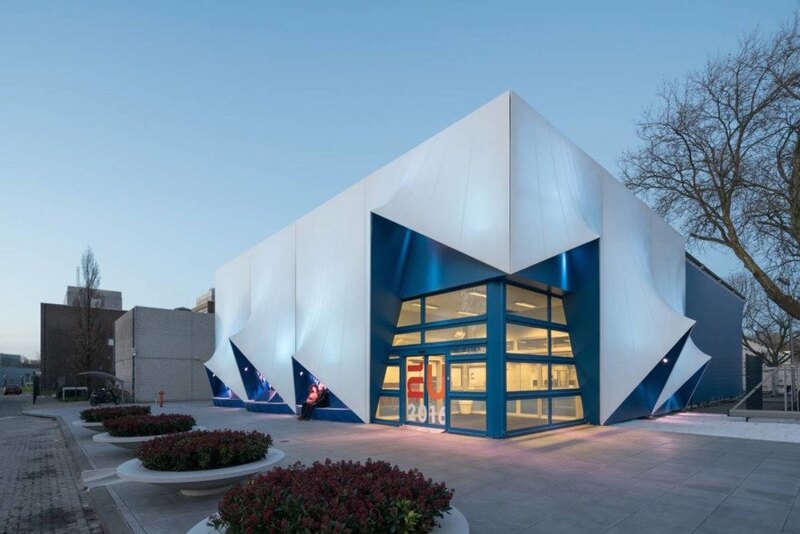 The sail-like facade is complemented with Philips colored and programmed spotlights as well as blue textured 3D-printed benches. On January 1, 2016, Luxembourg handed over the EU Presidency to the Netherlands. For the next six months, international meetings will take place in Amsterdam’s Europe Building, a 700-square-meter modular and demountable structure built by Neptunus, which will welcome approximately 17,500 participants, including many top ministers. 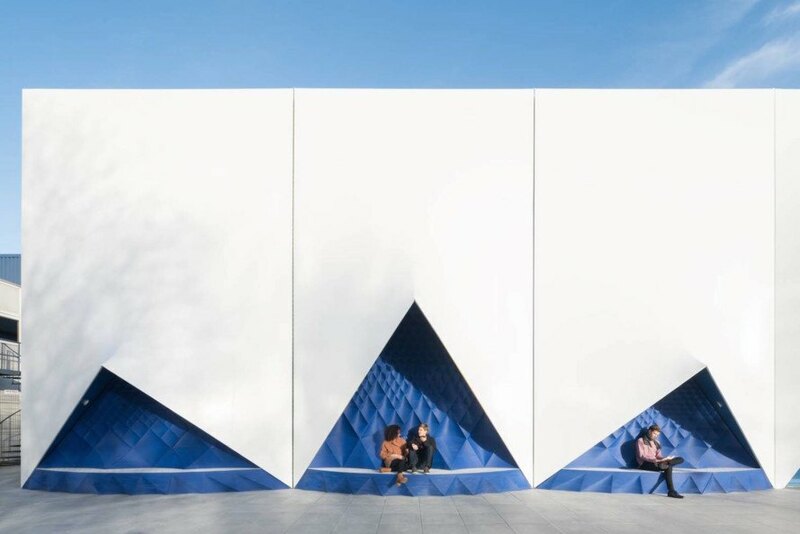 The 3D-printed facade and benches, however, also allow the public to interact with the building. “It is wonderful to see how passers-by sit in the façade. It really becomes a public place to stay,” said Martijn van Wijk, architect at DUS Architects. Each bench slots perfectly into the alcoves, thanks to precise nature of computer design and 3D printing. The textured patterns feature different shapes that illustrate both the diversity and convergence of the EU countries. "It is wonderful to see how passers-by sit in the façade. It really becomes a public place to stay,” said Martijn van Wijk, architect at DUS Architects. Each bench slots perfectly into the alcoves, thanks to precise nature of computer design and 3D printing. For the next six months, international meetings will take place in Amsterdam’s Europe Building, a 700-square-meter modular and demountable structure built by Neptunus, which will welcome approximately 17,500 participants, including many top ministers. The textured patterns feature different shapes that illustrate both the diversity and convergence of the EU countries. The facade and benches were 3D printed locally using the same large-scale printer used on the 3D-printed Canal House. The structures are made up of layers of bio-plastic put together using Fused Deposition Modeling (FDM) technology.